It was dinner time. 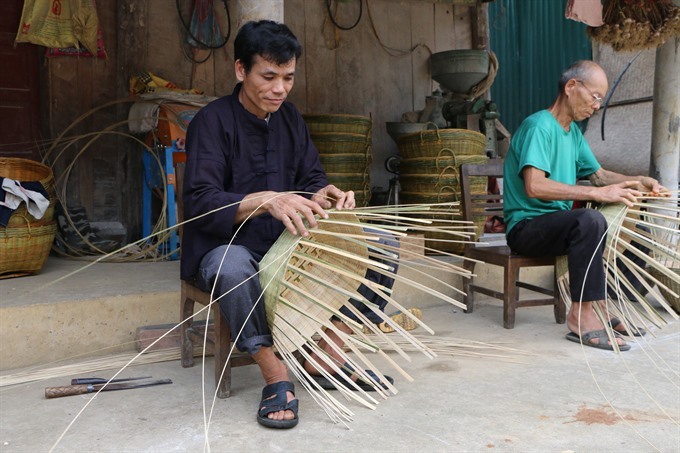 A group of six bamboo tables were scattered around the two-storey stone house of Ngọc Thị Ngọt, 30, and her husband. The food was plentiful and freshly cooked by the family. The food was good, but the overall taste was salty. “Has the cook just fallen in love?” I asked, jokingly. “They got married just nine days ago!” The mother of the groom replied matter-of-factly. Ngọt’s family and her neighbour, owning two old stone houses facing a large valley of corn fields, were taking part in a project initiated by Helvetas, an international NGO that has been operating in Việt Nam for 25 years. Since 2017, Helvetas has been training local hosts to open their homes to tourists. 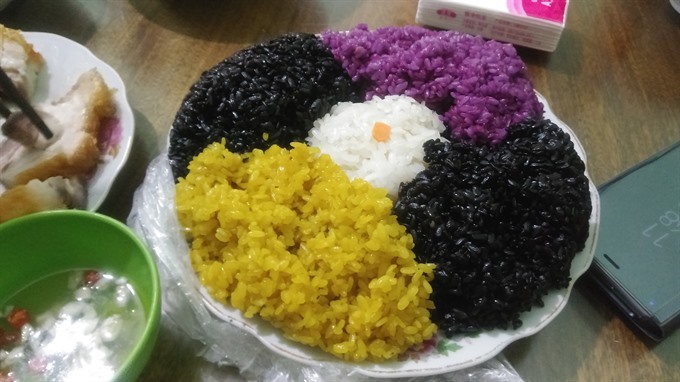 “We train local hosts in hygiene, housekeeping, food and catering services,” said Tạ thị Phương Thúy, programme officer for the project. 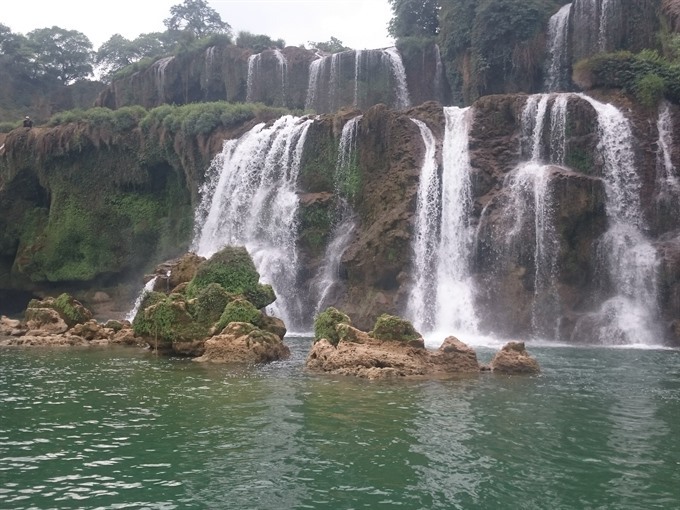 Conveniently located less than 10 minutes by bicycle from Việt Nam’s magnificent Bản Giốc Waterfalls, the homestays in Lũng Niếc Commune give you spectacular views to complement your visit to the waterfalls and the beautiful scenery in the area. “We invited a designer to help with redesigning the space in the houses and decide on the colour palette and bedding,” she said. The hosts benefited from the project, as the colours fit really well with the surroundings, and range in hue with the signature indigo colour. Basic accommodation, elegant bedding and brand new toiletries are among the amenities that the project helped with in the first phase. Brand new hotels are also within reach in the town at the foot of the waterfalls. But make a little effort to go further into Lũng Niếc hamlet and you’re in another world. Helvetas put together a big group from diverse backgrounds and nationalities, including the UK, Belgium, the US, Australia, Canada, Germany, and Việt Nam. 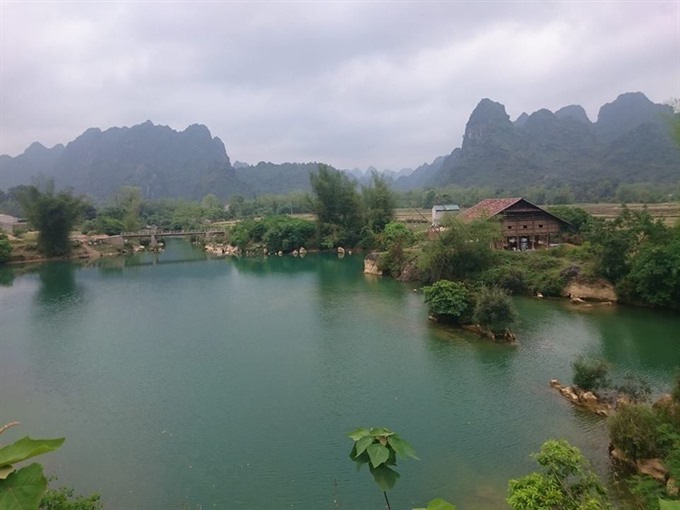 After six hours on the coach with a stop for breakfast in Yên Bái City, the first activity at Phia Thắp was to meet with local people in cementing the village water source so that children can play around it and people can fetch water for use at home. “Every household sends one person, that makes 50 of us, plus the tourists,” said the commune leader. 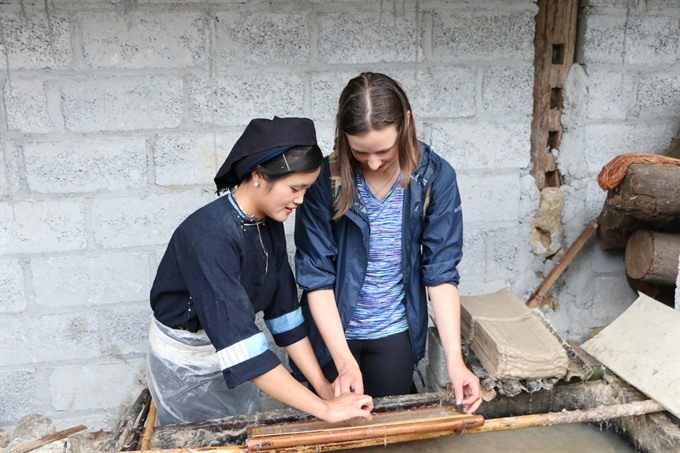 The villagers had already started their work when we arrived after the short ride from the paper-making village. It was quite dull and, I must say, more people were standing than were actually doing the work. Since the tourists arrived, they brought a new sense of meaning and a little sensation to the group. Everyone started to laugh when tourists began helping out. Positive energy spread throughout the group – men and women became more enthusiastic and the work progressed quickly. The tourists didn’t need much instruction; they just looked at what others were doing and did the same. 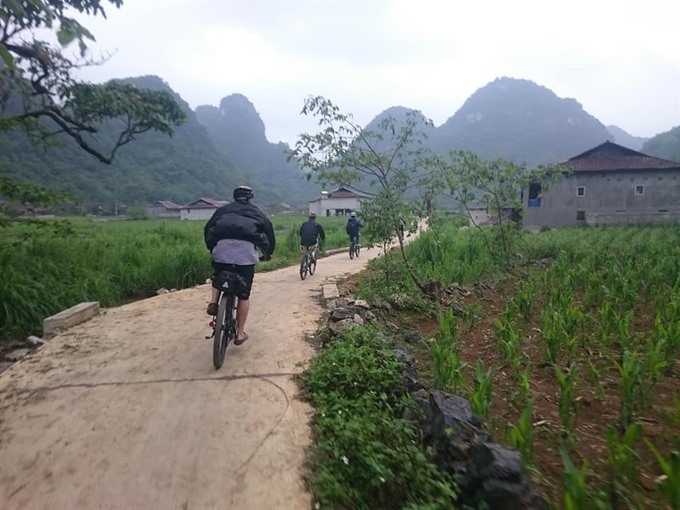 The next morning, when we left for the day’s cycling, Reece Guihot, an Australian cyclist, who designed the tour for Helvetas picked a stick and wrote: 2018 Cao Bằng Cycle. Reece Guihot, who is a professional in providing recreation trail solutions, has designed this tour so that the difficulty level increases each day. The total length of over 150km is divided into four legs, with the last 40km the toughest. On the first day, the team of cyclists arrive at Phia Thắp Village, located in the beautiful mountains of Cao Bằng. The corn planted in the valley had just survived the hailstorm that hit the province a week earlier. The leaves were all tattered and when we chatted about the unusual rain, a villager went back to his fridge and brought out a bowl full of small ice cubes. Mr Kim’s house is a wooden stilt house that can provide single beds for about 20 people. They provide breakfast, lunch and dinner for us all. It’s all fresh local produce and cooked everyday. Before the hosts can have any guests, they attended workshops by Helvetas, learning about hygiene practices, as well as how to create menus that are both nutritious and delicious. Schaub-Jones said she took on this tour to prepare for a bigger challenge at the Ironman event in Đà Nẵng. She had been a cyclist, but not mountain biking, which scared her at first. “But in fact it’s really fine,” she said. But actually something small did go wrong. The tour guide who was supposed to post road signs with an arrow ahead of the tour suffered mechanical problems with his bike. So the first group who kept pace with Reece Guihot went on to the destination. And the slower riders, who cycled behind picked the wrong path. I found myself in that group lagging behind with four other people including the group’s doctor. We ended up going up and down hill four times before joining with the other group heading for the lunch destination. Guihot obviously took this matter seriously and had the local co-ordinator promise that the mistake would not happen again. Spectacular view: The emerald green river of Quây Sơn leads to Bản Giốc Waterfalls. The highlight of this trip was the ride to Bản Giốc Waterfalls, Việt Nam’s most spectacular waterfall along the border with China. 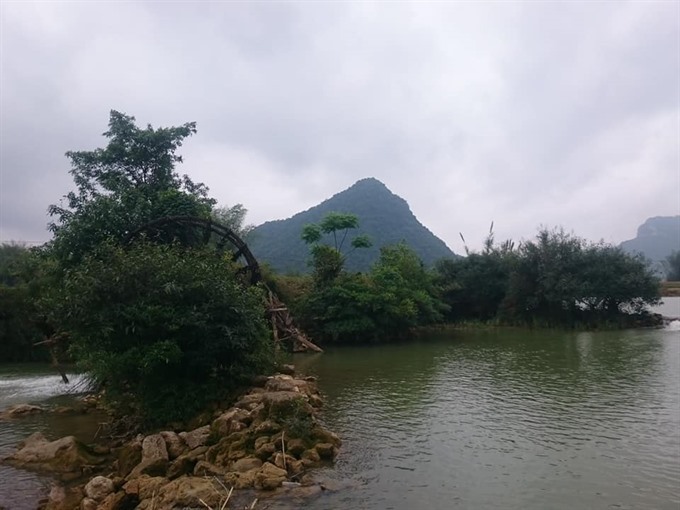 As we approached the falls, we travelled along the emerald green Quây Sơn River, which was dotted with graceful bamboo bushes. It looked as if it were an ancient landscape painting coming alive. We went in the dry season, so the waterfalls did not look their best with strong white currents. It was my first trip to Bản Giốc and it was impressive for me personally. Mr Điệp and Khánh’s homes are located at the edge of Lũng Niếc. We were the first to stay there. And it was such a great experience at a modest price. Helvetas brought in designers to help them restructure their homes to be able to host guests. Their stone houses are located in front of a round field of young corn, the region’s staple crop. In the morning, we would have breakfast on the patio overlooking the valley out to the blue mountains. Guihot says he’s working on a family tour, which may involve one day of biking, one day hiking and one day of kayaking. Children for the tour need to be at least 10 and be able to cycle from seven to 10 kilometres. He hopes to launch it some time next year.